With the fantasy playoffs nearing, injuries to skill position players are growing in importance. This week a few superstars left the gridiron with various ailments, but a few others appear to be making progress toward eventual returns. This week's Injury Update will discuss a few new injuries, as well as progress being made by a number of players coming back to the field. Amari Cooper left Sunday's game with a concussion, after taking a vicious hit from safety Darian Stewart. 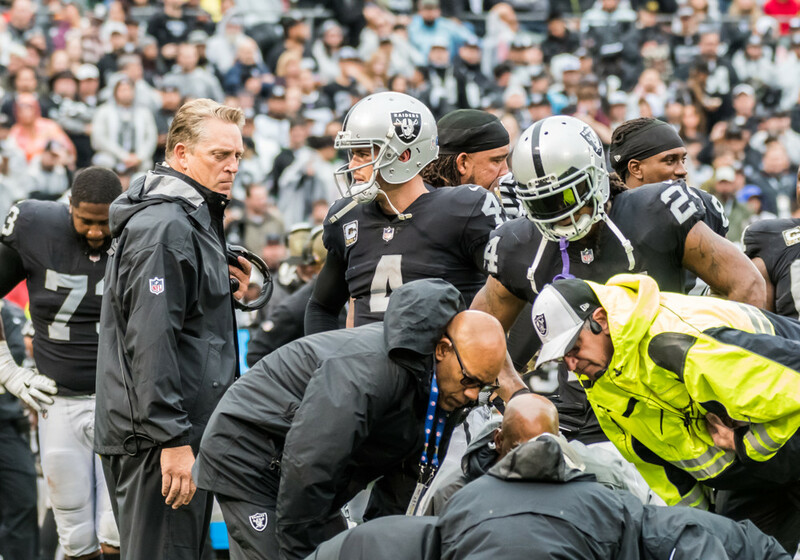 Coach Jack Del Rio said that Cooper was OK after the game but has been placed in concussion protocol. According to Adam Schefter, Cooper is also dealing with an ankle sprain. Cooper will have to pass each stage of concussion protocol and overcome his ankle injury in order to play. Right now, he looks doubtful for Week 13. Before Sunday Night's game, Aaron Rodgers could be seen unleashing passes in pregame warm-ups. One of Rodgers' passes reportedly traveled over 50 yards in the air. Rodgers is eligible to begin practicing again this week, but cannot return to game action until Week 15. These throws suggest Rodgers is on track and has a legitimate shot to return this season. Mike Davis performed well in his first extended appearance for Seattle in Week 11. Unfortunately, Davis also suffered a hamstring injury that prevented him from finishing the game and caused him to miss Week 12. According to coach Pete Carroll, Davis will play this week. However, Carroll is notoriously optimistic regarding injuries. These words put Davis on track to play, but he will likely enter the week as questionable. The Steelers ruled out Juju Smith-Schuster early last week with a hamstring injury. The injury initially occurred in Week 11 and his status for Week 13 is unknown. Hamstring injuries have been known to linger, but practice time will be important for Smith-Schuster this week. Consider him questionable for the time being. Doug Martin left Week 12 early with a concussion and did not return. Martin will now enter concussion protocol and battle against the clock to suit up for Week 13. Until more information is released, consider Martin questionable for this weekend. Rishard Matthews popped up on the Titan's injury report, after pulling his hamstring in Thursday's practice. Coach Mike Mularkey said Matthews is day-to-day, but he did not appear close to suiting up. For the time being, consider Matthews to be on the wrong side of questionable. His status for Sunday could come down to a game-time decision. Coach Sean McDermott finally revealed Monday that Kelvin Benjamin's knee injury is in fact a torn meniscus. Meniscus tears vary wildly and for the moment McDermott labeled Benjamin day-to-day. This suggests that his tear is not severe and he should play again this season. As far as this week goes, he looks highly questionable. Benjamin could have surgery after the season to repair issue. Devonta Freeman finally began to practice on a limited basis last week after suffering a concussion in Week 10. If Freeman responds well to contact in practice this week, he should be on track to play in Sunday's game. Freeman's practice reps should remain limited, but he appears to have a good shot to play Sunday. Greg Olsen aggravated his previously injured foot in Sunday's victory over the Jets. Olsen's X-Rays came back negative, meaning he avoided serious injury to the surgically repaired foot. According to coach Ron Rivera, Olsen's foot was sore and the Panthers held him out of the second half as a precautionary measure. It appears Olsen has a good chance to play this week, but until more information is released he should be considered questionable. Sterling Shepard has now missed the past two games with migraines. Last week Shepard traveled with the team and came in as a game-time decision. This suggests that Shepard was at least close to playing on Thursday night. With a full ten days to prepare, Shepard has a good chance to return this week. Ty Montgomery missed Sunday's loss with a rib injury. Montgomery aggravated the injury in Week 11 and has yet to practice. Ribs often come down to pain tolerance, so Montgomery's practice time will be important this week as he prepares for game action. He likely will come into the game as questionable.